Toorak is a residential suburb 5 km south-east of Melbourne. Its social boundaries have been precisely fixed by its postal district boundaries (SE2 and 3142), which are Williams Road, Malvern Road, Glenferrie Road and the Yarra River. 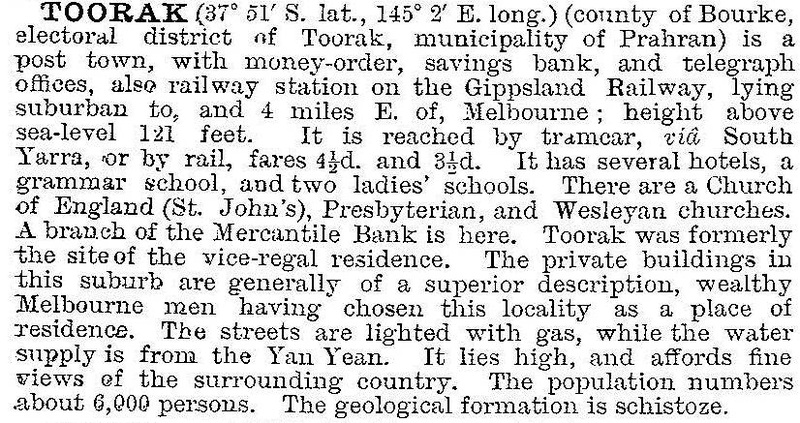 The only authentic part of Toorak outside these boundaries is the railway station, just south of Malvern Road, and its situation is verified by the Armadale North post office being in the shops beside the station. The name is derived from Toorak House, a residence built by James Jackson, a merchant, in 1849. The word may have been derived from Aboriginal words of similar pronunciation meaning reedy swamp or black crow. Toorak House, with its Italianate tower, and now in St Georges Road set the architectural style for Toorak. Jackson died in 1851, and Toorak House became Government House until 1879. It is now the Swedish church. Road access to Toorak House was along the Gardiners Creek Road, now Toorak Road, and it was the first good road through the area. 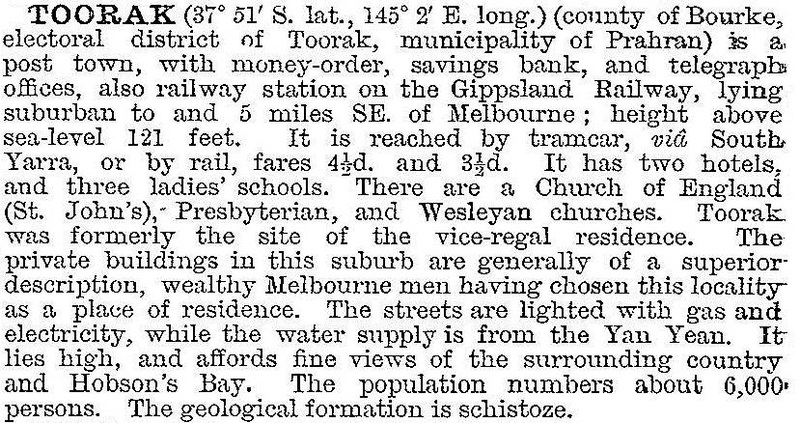 Subdivisions occurred along it and a hotel was built in 1855 on the site now occupied by the TokH in the Toorak Village shopping centre. Toorak continued to be the site for elegant residences in spacious grounds. The population figure of 6000 is probably an exaggeration, perhaps early evidence of residents vying for the best address. The census figure for 1911 was 3630, and the estimate for 1920 was 5700 after considerable subdivision of the large estates had occurred. Financial depression, increasing costs of upkeep and taxes on property resulted in several sites having their gardens subdivided for suburban allotments or the houses converted into flats. Some subdivisions had new houses put on them but many had flats. Toorak remained an excellent address and a flat was a way of achieving it. Flat development was continuous during the 1920s and 1930s, and by the end of the 1930s there were almost as many flats in Toorak as houses. In the postwar years the process continued, with high rise structures becoming notable in the 1970s. Trade and industry in Toorak are confined to the shopping area. The rest is residences, churches and schools. Secondary schools for boys are mostly outside Toorak, but Glamorgan Preparatory was opened there in the early 1920s when travel and boarding were not preferred for younger pupils (although boarding was available if wanted). It has become the primary school for Geelong Grammar, has attendances in excess of the State primary, and has been co-educational since the early 1970s. St Catherine's non-denominational (1922) and Loretto, Mandeville Hall (1924) provide girl's secondary education. The Toorak College (1897) for girls was moved to Malvern in 1918. At the northern edge of Toorak where it is skirted by a railway line, the Heyington railway station delivers boys to the Catholic St Kevin's College (1918). Next door is the Kooyong Lawn Tennis Association, venue for international tennis contests until the opening of the sports and entertainment centre in Flinders Park, Melbourne. Toorak's prestige is undiminished, despite some of its grand residences being confined by newer houses and flats. The village is a major shopping centre, notable for its reliance on dining out, fashion and decorative homewares. Its streets are undisturbed by public transport except along Toorak Road. Several of the remaining grand residences, two churches and the State school are on either or both the Commonwealth or State historic buildings registers. Later buildings are also heritage listed: Sir Hamilton Sleigh’s house (1936) Wallace Avenue, Quamby flats (1941) Glover Street, and Caringal flats (1948) Tahara Road. The median house price in Toorak during 1987 and 1996 varied between four and seven times the median for metropolitan Melbourne. At the 2011 census, median incomes in Toorak were 84% above the Victorian median. E.M. Robb, Early Toorak and district, Robertson and Mullens Limited, 1934 (With illuminating pictures of spacious residences, published when many were being subdivided or pulled down).